Instagram today rolled out new sticker tools meant to help people be more creative in their posts and stories. First up is the ability to turn your selfie into its own sticker. Instagram says the latest version of its mobile app lets people capture mini selfies, apply frames, and use the framed selfie as a sticker on posts. The selfie sticker can be resized, moved around, and enhanced with other tools. 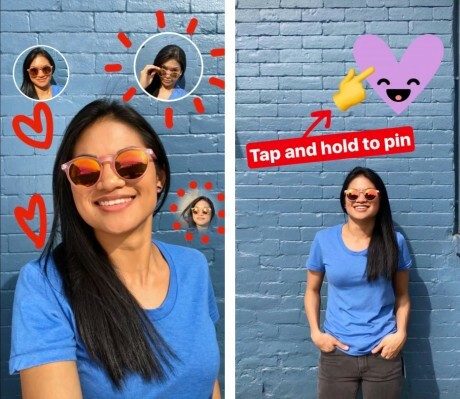 Selfie stickers can also be pinned to videos, including those shot with Boomerang. The new Instagram adds four more geostickers so people in Chicago, London, Madrid, and Tokyo can dress up their posts with artwork and themes related to those cities. Geostickers are interactive, so people who watch a story can tap the sticker to see the location page. Last, Instagram is making it easier to find stickers thanks to a new shortcut. The tool will pop up users' most recently used stickers for quick access. The new version of Instagram is available for Android and iOS devices. Instagram today announced Instagram Stories, a new way to share photos and videos that is similar to Snapchat's Stories. With Stories, Instagram users can post as many photos and videos as they want throughout the day and customize them with text, stickers, and drawing tools. Instagram today introduced several new tools that will allow users to hold onto their fleeting stories more permanently. First, Stories Highlights let people create a featured story that can be pinned to their profile.